and my diet was the best it has ever been. POUND, Hot Yoga, Yin and Restorative Yoga all combined together gives me balance, strength, flexibility and focus. I’m now challenging myself to continue to eat clean while maintaining regular exercise as a lifestyle change. Although I was not the official “winner” of the challenge, I’m pretty sure I’m winning with my health and happiness. Myself and 3 others were highlighted in the “And the winner is…” email that announced the winner on July 1st. I can’t begin to say how grateful I am for this challenge, and for the gals at Firelight Yoga for creating a space, close to my home, where I go again and again to center myself, challenge myself and pay gratitude to my body and mind. Below is my class visit history for May, and my slightly cheesy TLDR submission for the Highway to Well Challenge! I’m looking forward to participating in this challenge again next year, how about you? Born and raised in Southern CA. Portland, OR for the past 7 years. Are you a POUND Pro? I got certified March 20th, and have been slowly memorizing the tracks at home and continuing to rockout every week in class. My main motivation to get certified was having the ability to take POUND with my friends on all of our amazing summer camping trips in Oregon. Camping will never be the same again! My fitness journey began about two years ago when I discovered hot yoga while living and working in Melbourne, Australia. Exercise has mostly been a part of my life but there were times when I let it go and my body suffered, primarily right after college when I was working in LA. One Hot Yoga in Melbourne opened my eyes to how amazing your body can feel in one hour of sweating it out on a regular basis, and how important it is to make time in your schedule to do so. Because I sit in-front of the computer all day for work, back and neck pain has been a constant battle for me. Regular yoga has drastically improved my daily pain but I will always have to work hard to keep it under control. After coming home to Portland, I knew I needed to cancel my gym membership and find a hot yoga studio close to home. Having a space where I feel inspired, motivated, and safe is essential. For me, having that space conveniently located to either work or home is KEY to fitness success – no excuses, just get there! I’m also extremely grateful that I’m currently able to work for myself, from home, as a freelance Graphic Designer. I know the flexibility I currently have in my schedule may not last forever, so I’m taking full advantage of it right now while I do. Shortly after returning home to Portland, a new hot yoga studio opened up within walking distance of my home. The stars were aligned! Firelight Yoga is now my second home. After a year of practicing at Firelight, completing their 30-day challenge in May 2015, and regularly taking the Hot FLY-60 class, I set my 2016 New Year’s intention to expand the type of classes I was taking. That’s how I found POUND! I was instantly addicted to POUND! I couldn’t get over how sore my thighs were the first few weeks of class since I regularly do yoga. With different muscles getting utilized during POUND, compared to yoga, I could feel a physical change in my overall strength after adding POUND into my weekly mix of classes. Class is also SO MUCH FUN that I don’t even realize how hard I’m working out. When I heard there was going to be a teacher training I knew I had to do it, so I did! After completing the training, which encompassed a full hour class 3+ times in one day, I knew this was the start to something even bigger for me. 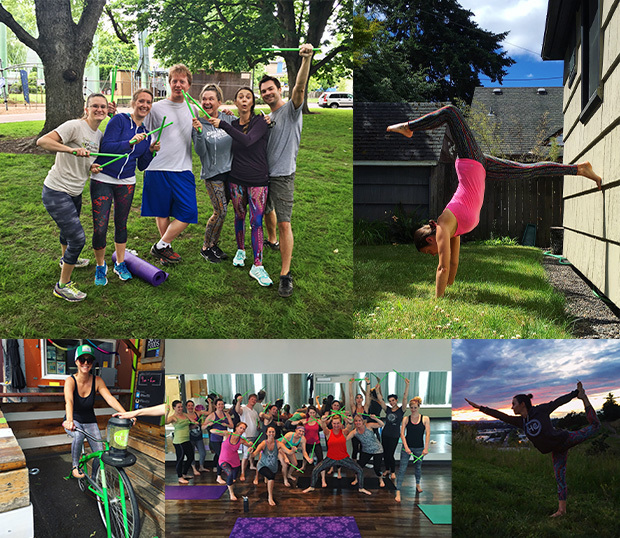 This past April kicked off yet another fitness challenge at Firelight Yoga, 30 classes in 40 days. Being out of town for the first 10 days of the challenge, I didn’t think it was possible so I decided “not” to do it. However without realizing it, I managed to attend so many classes that I was within reach of completing the challenge if I had a strong finish. The end of that challenge overlapped the beginning of Highway to Well… I was on fire! My inner badass was breaking through on May 14th when I successfully completed the Firelight challenge. Today I’m still riding on the Highway to Well even though the challenge has ended. Did you participate in live classes, our Vimeo videos, Rockout Results or all 3? Every Saturday and Monday at I was POUND’ing it out at Firelight Yoga with Wendy Lafady (BEST teacher). I rocked out to 3 of the 15-minute Vimeo videos at home, and continued to practice my own playlist. Did any of your workout habits change along the way? YES, ongoing self-care and restoration thru stretching, moving meditation and a few visits to my local wellness spa. Week two’s email talking about “giving back to your bod” was the perfect message to get me to do just that. With the large number of workouts I was getting in, it was extremely important to stretch every day. Yin, a class to restore your bones and connective tissue, was a weekly class I never missed. I also took a Restorative Yoga class for the very first time and now go every Wednesday. It’s all about finding balance between strength and flexibility… and the occasional body treat! Did you make any mixtape meals and if so, what was your favorite? Pretty much any meal is better with sauce on it! Week three’s Roasted Red Pepper Sauce with garlic and almonds was so flavorful. Not only was it super easy to make, my house smelled amazing while the peppers were roasting in the oven. Week two’s Cilantro Sauce was also a big hit for me. 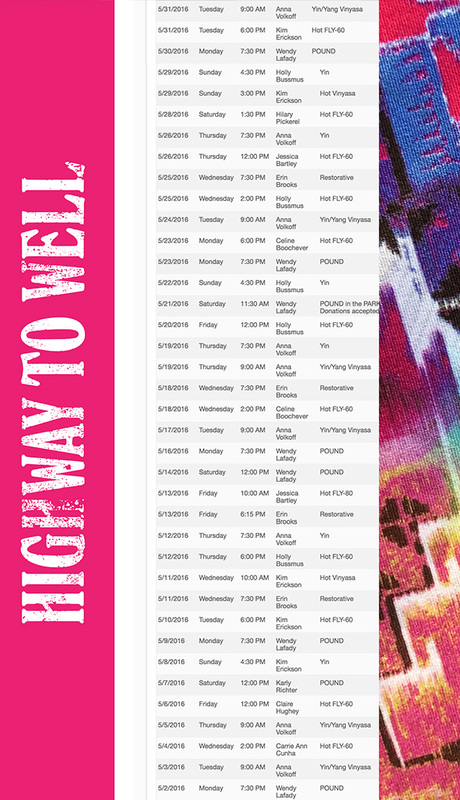 What inspired or motivated you to get on the Highway To Well Tour? My motivation to smash the Highway to Well challenge came from the strong desire to change my diet habits for a more healthy and balanced lifestyle. The amount of artisan Portland pizza and beer I was consuming needed to get minimized! Having the support of the online community to help me keep it up was exactly what I needed to stay on key. Also the motivation to get my bikini body ready for summer didn’t hurt! What did you learn on the Highway To Well & where did you see your biggest growth? My biggest personal growth was definitely with my diet. I’m now challenging myself to continue to eat clean while maintaining regular exercise as a lifestyle change. This will allow the best version of myself to shine bright. POUND, Hot Yoga, Yin and Restorative Yoga all combined together gives me balance, strength, flexibility and focus. I am full of gratitude for all of this. I also got to learn how to make an avocado rose! Avocados are delicious and nutritious, and with such a simple technique you can make any meal look divine. 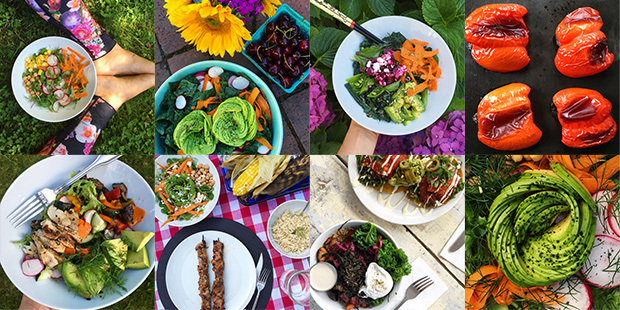 Check them out on my Instagram feed (@tracycaretto)! How do you feel today vs 30 days ago? AMAZING!!! I’m more comfortable in my own skin, stronger than I have ever been (mentally and physically – I can finally do pushups!) and more flexible. I impressed myself with how much determination I had during this challenge. I now have the confidence that if there is another challenge or goal I want to accomplish, I know I can do it! What was the biggest bump in the road and what helped you navigate through it? Our local grocer sells a delicious mini Garlic Romano baguette, HA! Week three’s email mentioned that this was “often the point at which we lose steam or start to make small exceptions” and I did just that. I couldn’t resist the smell of the garlic warming up in the toaster… I had to have it! After that night of eating half of the mini loaf I made a new rule for the remainder of the challenge that no more delicious bread was allowed in the house. Nick would have to eat his bread elsewhere, luckily he supported that decision and has cut back on his bread consumption post challenge. The online community that I connected with thru Instagram was supportive ALL month long, and continues to be today. I loved seeing all the different #mixtapemeal variations and Ripstix photos. Every day I dedicated time to viewing the #highwaytowell progress not only to give others support, but to boost my motivation. It’s pretty amazing that connecting with a total stranger can provide the support and motivation you need to stay on target. The daily greetings, encouragement and smiles on the faces of the teachers at Firelight Yoga truly makes it feel like my second home. As corny as this sounds, the theme song from the TV show Cheers often pops into my head as I walk thru the doors: Sometimes you want to go, where everybody knows your name… etc. The POUND class at Firelight Yoga was also supportive. When I told them about the challenge they were all very excited to hear about it. As I entered the final week, it felt great to have a fellow classmate tell me what a great job I was doing and that she couldn’t believe it was almost over. One month can go by pretty fast! Which social platform do you primarily use and what is your handle? Instagram @tracycaretto, a little bit on Facebook too but Instagram is my preferred platform for inspiration and motivation. If you had a Highway to Well bumper sticker, what would it say? If you’re Healthy and you know it Honk your Horn! What did you do with POUND that has resonated with or affected others in some way? After taking my first POUND class in January 2016, the following week I sent out an email to my neighborhood friends to get the Firelight Groupon, and come to POUND with me. I’m overjoyed with the amount of friends that are now regulars with me in class. I have gathered my local POUND posse: Nick, Adam, Wendy, Julie and our badass teacher Wendy! What is your favorite thing about POUND? It’s a GREAT workout but my teacher, Wendy Lafady, is seriously the BEST! She has the biggest heart and is constantly encouraging me to keep at it. Her positive attitude is contagious and fills every class with laughter. I love looking forward to weekly fitness fun with friends, two Ripstix up!